This Saturday 9/12 is our 34 year anniversary. I am a girl that is pretty low maintenance for gifts. Diamonds may be a girls best friend but give me a beautiful old piece of history and I am a happy girl. I did not need another TV armoire but when I saw this sweet hunk of gorgeousness in Tattered Tiques I just fell in love. So I came home and told Terry about it and he said if you love it that much lets go take a look at it. God I love this man!!! So off we went to Tattered Tiques. Here it is sitting in the shop at Tattered Tiques. The girls at Tattered Tiques told me a lady had this custom made and sent over from Germany. Oh the pretty lines and beautiful wood. 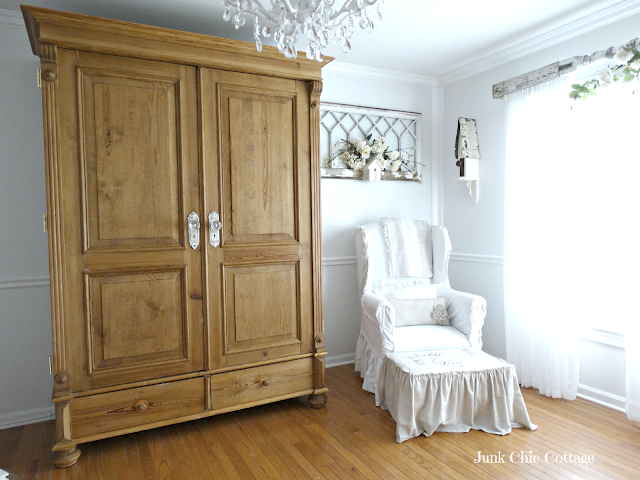 It is hard to find an actual vintage armoire that can fit the large screen TV's. Vintage armoires were usually smaller and made for clothing without the thought of big TV's being stored in them. This sweet piece was going to fit Terry's 60 inch TV so I was so excited, Terry was excited and all the customers and girls at Tattered Tiques were excited the Moose TV would fit!!!! Yeah!!!! So my anniversary gift was coming home. The vintage key and lock work on this piece too. The girls at Tattered Tiques gave us a wonderful deal on this gorgeous piece so we took it apart and loaded it in our car. Yep!!! 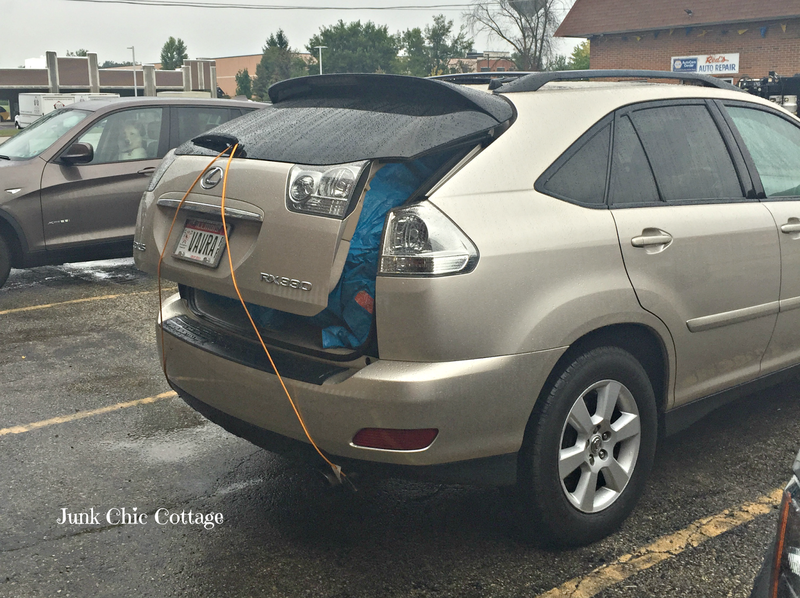 it came apart like a puzzle and we were able to move it home in the car. Of course Terry used his tools when he got home to put it all back together. It was easier than we thought. Look at who is sitting in the drivers seat of the car parked next to us in the parking lot. Isn't she hysterical. She sat there and watched for her owner to come out of the shop. She was such a sweetie. I just loved the expression on her face as she watched Terry and I load the pieces of this armoire into the car in the rain!!! Once we got this beautiful piece home and put back together I took some wood oil and gave her a nice coat. She was very thirsty and drank almost the whole bottle of wood oil. The wood oil gave her new life and brought out her beautiful color and lines. I had these pretty unique door knobs that were close in style to each other. Terry attached them to the doors. The key hole lined up perfectly so I can lock this piece if I want with the skeleton key. Ahhhh she is just so pretty mixed in with my whites in this room. Terry painted the inside of the cabinet white to have it look less dated when that big ole moose of a TV is being watched. I am looking for some nice baskets for the bottom shelf to put my throws etc. in for winter. See the large sound bar and speaker. MEN and their TV's!!!! She is a keeper. This is one piece I will not be painting white. I know, I know hard to believe "Miss I love everything white and chippy" will not be painting this fabulous piece!!! Love her beautiful wood too much and the fact she was custom made and came all the way over here from Germany. I need to honor the history of this beautiful piece. Gives warmth to this room and compliments my wood floors. I promise you this will not be painted white!!!! Yep you heard me right I am not going to paint this one and now you all have it in writing lol!!! 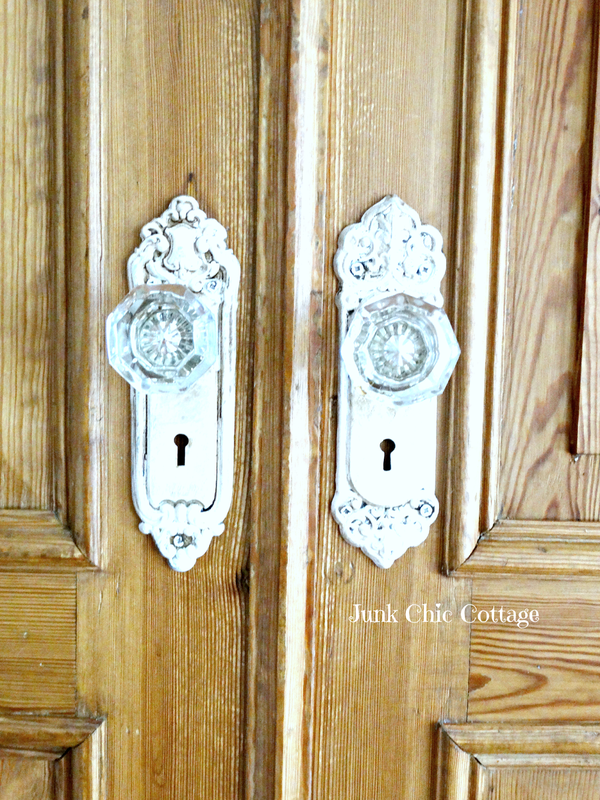 I am on the look out for some pretty antique knobs for the bottom drawers. I hope to find something fabulous at the flea markets. September 12, 1981 Our Souls Unite. Happy Anniversary to the love of my life. You make my heart smile and you have brought so much joy and love to my life. Through thick and thin you have been my rock. I love you. Thank you for sharing your life with me. Each day spent together is truly a beautiful gift. Come back on Saturday for a wonderful new blogger in Spotlight and Sunday I will have some news to share in a post. Happy Anniversary!!!!! 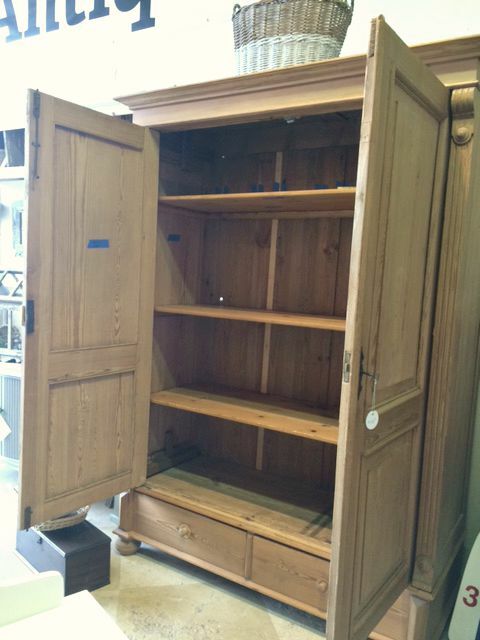 What a wonderful armoire.....such an incredible piece! I can see why you fell in love with it instantly!!!!! It looks perfect in the room and I love the way it ties everything together. The whole room looks gorgeous!!!!!!!!!!! Oh my goodness, you two are SO, SO, meant for each other. Many happy anniversaries to you to come in this life, and special wishes for this 34th! Still, you are such a beautiful couple - then and now. Okay, I love this armoire, and the fact that it's a breakdown even better. WHAT did you do with the altar?? And did you give oath on a bible that you'd never paint this because otherwise I will have a hard time believing that. We know you too well Kris...but it sure does look fabulous on your wood floor. Happy anniversary. I don't believe for a minute that you will not paint this piece. I give you 6 months. Happy Anniversary to you and your hubby!! Kris she is a beauty!!! Happy Anniversary! Your armoire is indeed a beautiful piece. Love it, and it adds so much personality to your lovely whites. I'm a paint it white girl too. :) Enjoy your special day. Happy Anniversary to you both! That is a beautiful armoire to hide those huge t.v. 's our husbands have to have...lol. Happy Anniversary!! I just love the way you write about your marriage, Kris. What a beautiful piece to celebrate a beautiful couple! Happy Anniversary you two!! What a gorgeous couple, both then and now. I love hearing about the way you guys work together. The piece is absolutely gorgeous. It looks perfect in the room and I love the way it looks with the floor and the leather chair. The room is fabulous. Enjoy it and enjoy your anniversary! Happy Anniversary dear friend! Love your new piece and think it looks gorgeous in the natural wood. Beautiful piece. Have a great day. Happy Anniversary, and wow that really is a beautiful piece. Looks so pretty in your room. Happy Anniversay! I love how you love each other! What a precious couple! The piece is perfect! I can't believe you got it in your car. Amazing. I laughed at the dog before I even read your comment. What a queen or king is that! I think the armoir looks great among your whites. The natural wood makes the white pop! I love it! Happy Anniversary. My husband and I just celebrated our 34th on 9/5. I hope you enjoy your day! Well Happy Anniversary to you Fran. I remember how nice September was that year we got married. It was a beautiful month with lots of 70 degree days. Enjoy your special day too. By the way I read your blog regularly and very much enjoy it but I don't think I have ever commented. Well thank you Linda for taking time to comment. I appreciate your sweet comment. Have a great evening. Happy Anniversary to such a darling couple - love that picture! That armoire is beyond fabulous. I wouldn't paint it either. Have a lovely special day together. Wishing you a very Happy Anniversary, the photo of you and Terry on your wedding day in 1981 melts my heart. Very precious photo and thanks for sharing it. Love your Amoire and its a beautifully custom designed piece that adds warmth in your home. I think the natural wood is the perfect choice. Terry rocks with his kindness and excels with his ability to recreate anything. It must of been kismet because it's holds all your equipment like it was custom made for you! You both are adorable, and very fortunate to have found each other!!! Wishing you many more happy years!! Happy Anniversary!!! 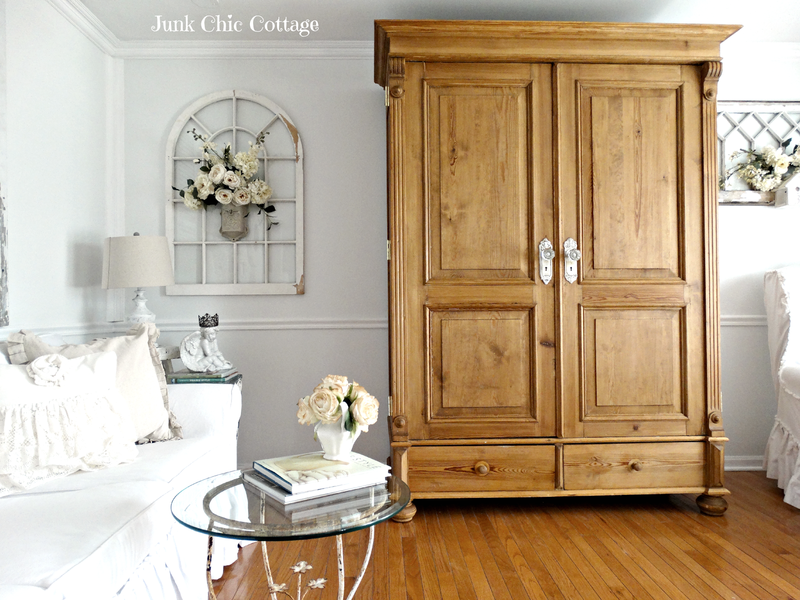 What a wonderful vintage armoire to hide your huge tv. I prefer the tv to be hidden, ours is. It also gives the room a simple, clean look. 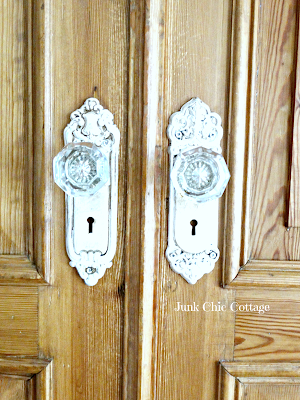 I know you say that you will not paint it but just seeing the inside white makes me hope that you will paint the outside white with distressing for your Junk Chic Cottage chippy look. So where did the large altar go? Happy Anniversary to you two!!! Wishing you many more years of happiness! :) I LOVE the armoire! You're so right about it being hard to find one to accommodate the big televisions we all have now. What a score! She looks so pretty with the wood oil you applied. Oh, and that doggie is cracking me up! And yep, I'm very familiar with the whole soundbar/speaker debacle over here too. Lol! Happy Anniversary and what a gorgeous present! Glad you are keeping it wood! Happy Anniversary, Kris and Terry. I think you have finally found the absolutely perfect piece to bring your livingroom together. You're so right about it blending with the floor to anchor the room. Sometimes too much of a good thing lacks one thing to make perfection. Also like the white knobs and paint inside. At first I thought maybe the contrast between the tv and the white would be overpowering but then I thought......who looks at a black screen? It will be color when it's on. And I'm so glad you got rid of the leather.....just wasn't right for your room and didn't feel like you at all. Will be interesting to see what you did with the other livingroom piece.......have a wonderful 34th! Happy Anniversary to the both of you!!!! That is a beautiful piece Kris. Such pretty wood grain. Warm, golden wood a nice addition to your pretty living room, and a good hide for the TV. What a beautiful couple you are, still making each other happy every day! The best! And that piece is gorgeous, and I love that you are keeping the exterior (for now -- wink, wink) in the natural tone. I think it's perfect. Your armoire is amazing! It's incredible that you fit that big thing in your car. The wood is gorgeous....I'm glad you won't be painting this one. Beautiful piece Kris!! My hubby has a sound bar also. I sooo agree with ," Men and their tv's!!!" Happy Anniversary Kris! Love the wedding photo!!! :-) The armoire is gorgeous and Terry is such a doll to do these things for you....a wonderful man! Rest this afternoon and we can catch up tomorrow! Hugs! Happy Anniversary to the both of you! Love how the armoire adds some color to the other side of the room facing the leather chair :),it looks beautiful! Happy anniversary!!!! You are a such beautiful and romantic couple. 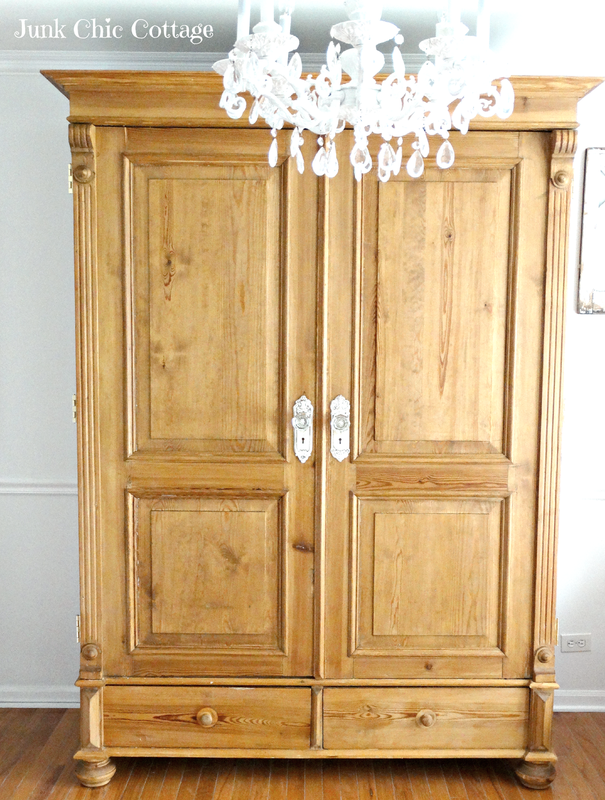 The armoire is gorgeous and it looks perfect for your room. I came back for a revisit and oh the dogs face is priceless... check on Saturday a little something from your poetic friend. What an adorable couple you both are!! Happy 34th! you won't paint it, Kris? It really does warm up the room nicely. Happy Anniversary! That is a beautiful gift and looks fabulous in your room. Oh my Kris, is the universe speaking to both of us at the same time, come vist the post I did yesterday you will freak out at my vintage armoire and what I did to it, but my inside is not white it was left dark, sanded and roughed up to hold a faux finish of a messed smeary look to it, giving it an abused abandoned feel of salvage to it... After my self is painted adding to the three already in it it will hold books magazines, old textile throws for winter days, no TV... I was so happy when we moved that we kept the smaller Sony over the 60" we my daughter and I don't watch much TV, movies yes! So the tv is in the guest room turned office and Tv library room, perfect, cozy and out of sight TV. This is a perfect piece for you, no Altar? You said you would not paint that you did, you said its a keeper, and I don't see it :) the shutters that hid away the TV was perfect for the look and Now better yet the ARMOIRE ! And wow it's a beauty.... It matches with the leather chair not competing for attention but demanding it and that's what I love about adding Drama to a room. Please come over, I was laughing to myself and thinking Kris and I are on the same line of thought. Like the siding in the kitchen unit that holds my pottery. I gave this piece plenty of screws to hold that backing on and the neighbors are always shock at the building sawing and remolding I am doing in my garage and driveway much like you guys I am sure of that. See you soon. I love it and you did good for this Happy Anniversary... Love the wedding photo, must feel good to look back and see all that you guys have shared... You guy is the bomb! PS. I painted mine from what it was to what it has become old and looking so much more rural French. Happy Anniversary, Kris and Terry! What a beautiful couple on their wedding day! Kris, the armoire is simply gorgeous, full of character, and looks perfect in its new home. I breathed a sigh of relief when I read that you were not going to paint this gem. But, I agree, the inside does look great in white! Enjoy! Well aren't you two the cutest couple in creation?! Happy Anniversary dear friend! and I am so envious of your gorgeous armoire - and those knobs are to DIE FOR! So beautiful! I am in love! And you know me and painted furniture, lol! What a great find and a true gift of love you got. Happy Anniversary to the both of you! Happy Anniversary. It's a gorgeous piece. Happy Anniversary, Kris, LOVE that wonderful wedding photo, so so cute! your new armoire is just super amazing, I don't think I've ever seen one that big. what a find, and no she doesn't need to be painted, that wood is beautiful! Happy Anniversary. I loved reading this post! Tattered Tiques is such a great store! 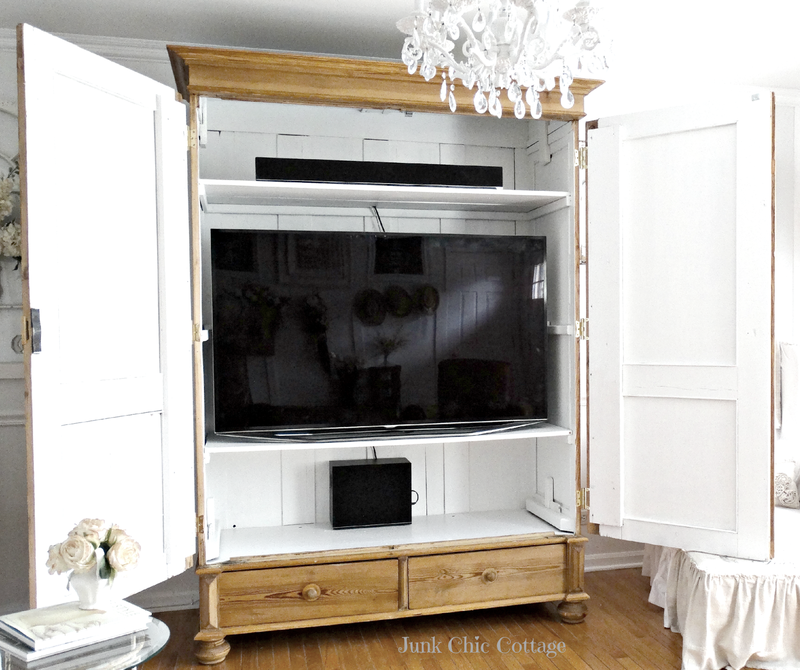 I love that tv armoire, it is just beautiful! I couldn't paint it either! I think it looks amazing with your floors and with the leather chair. A nice contrast to the white. I love the handles you put on too. Beautiful! 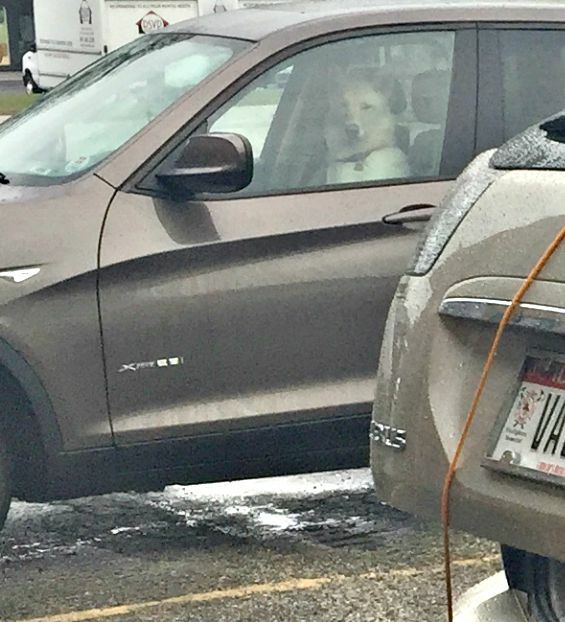 I noticed the dog right away in the other car, the expression on his face...what must he have been thinking? Ha ha. Happiest of Anniversaries to you! 34 years is something to be very proud of! I love your new armoire, especially the pretty knobs you added. Great touch! Happy Belated Anniversary, we recently had one as well. Happy Anniversary to you and your hubby. It is so nice to see a couple weather life together. I have to ask....is this replacing the altar?? If so what plans do you have for it. I know you plan not to paint the new piece, but I secretly don't believe you teeheehee. I do love a little wood mixed in with your whites...but your the one whose opinion matters most in your home. I so look forward to your posts. Happy Anniversary to this cute couple!!! Terry was a very good find, Kris, always putting up and helping with your redecoration ideas ;). Didn't you just recently put shutters in front of the TV? However, the new pieces is very pretty. Mhhm, we really should believe that you're not going to paint it? I would never never never ever bet on that, lol. Have fun with your new furniture and have a fabulous anniversary day! WOW. YOU SCORED in more ways than ONE, Kris! I must say, your husband has the most gorgeous eyes, and YOU - lord above, what a beauty you ARE! Congratulations on your anniversary! Don't we both have the best guys? My husband always surprises me too and yes, they both need their TVs, but we two woman always figure out a way to make the look of that monster thing more gentle! Happy Anniversary....everything about this lovely armoire and the story of how you and your hubby made it yours and his is wonderful! Happy Anniversary! Your anniversary gift is very special! Looks beautiful among all of your whites. Happy Anniversary, Kris! I love your 2 sweet wedding photo! And you two were meant for each other, it's plain to see. Your new armoire fits your space perfectly and I like the natural wood finish against all your whites. It's really a quality piece and your hubby as a gem to take it all apart to get it home and then assemble it all over again! 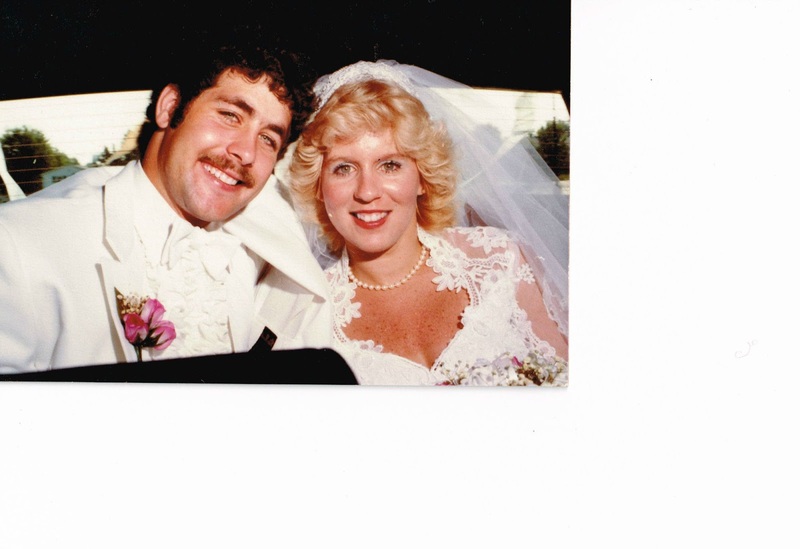 Happy 34th Anniversary to both of you. So we married almost the same day (mine is Sep 13)!!! 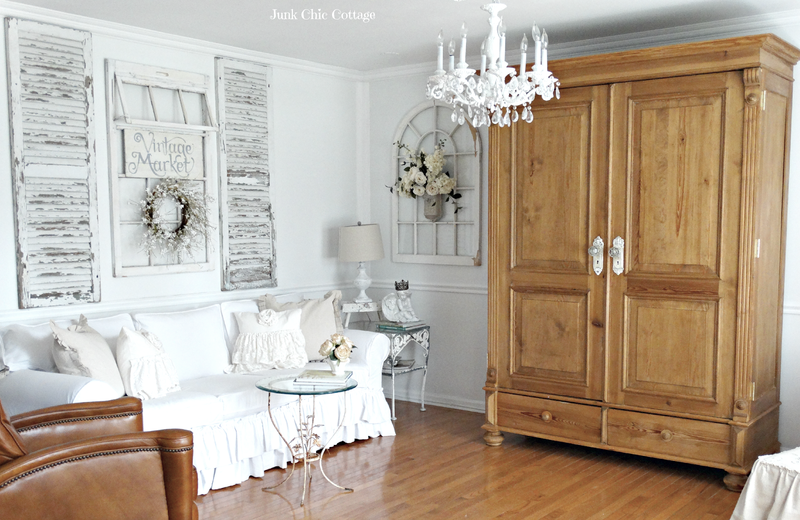 That armoire is just so beautiful and looks great with the leather sofa chair in the room. I love how the oil brought out the richness of the wood. You might not get to this comment (I subscribe and don't get your posts until the following day), but I first want to congratulate you on your anniversary! Next, I love this piece, and the knobs you added make it exquisite. I have to say I like your room much more now with that beautiful piece in it because it seems to balance out better with the wood/chair. LOVE IT! Dear Kris, you and Terry give me hope that there can be amazing couples that are true and honest and loving with each other. You guys marvel me all the time. When I grow up I want to have a marriage just like you two. Now to the cabinet, HOLY COW it is awesome! The color is perfect, it looks like to made it to go right in that spot. So beautiful! Have a wonderful weekend, and another wonderful year together. Happy Anniversary! What a lovely gift to each other. Just like you and Terry it was meant to be!! Wishing you both a very happy anniversary Kris. You certainly seem like a match made in heaven. Meanwhile, LOVE, LOVE, LOVE the new armoire, what a fabulous find, and it really does compliment the other furniture in your room, while providing the perfect home for Terry's monster TV. Have a wonderful weekend you guys. Happy Anniversary to you two!!! I love the picture of you and your husband. The armoire you got is beautiful. What a wonderful piece. I love how you painted it white inside but left the outside natural. That is the perfect piece for your TV. I know ALL too well about how men want a huge TV and the gadgets to go along with it. We have a sound bar on ours and a surround sound speaker hidden behind our sofa too. LOL! Oh you two - what a gorgeous wedding photo! Kris you're such a beauty and Terry is gorgeous with his sideburns and white suit! Wishing you both a "Happy Anniversary" and many, many more to come! Terry is indeed your soul mate girlfriend, I would have a job dragging my love to the shops like that! Now if it had anything to do with boats, he would beat me out the door! I have a feeling that your man likes the piece as much as you. The wood just glows now! You two are so cute together and happy Anniversary :) I would rather have what you got than diamonds too. What kind of wood oil did you use? My old library table that's used as a dining table could use a good drink. Happy anniversary - cute wedding pic. Fantastic gift! Oh Kris, Happy Anniversary to you both. What a special couple you are. Love the armoire is beautiful. Such great workmanship. The wood is stunning and looks so good in the living room. Your wedding picture is beautiful - so much in love. What kind of wood polish did you use? My table could use a good drink of oil. Happy Anniversary, Kris! 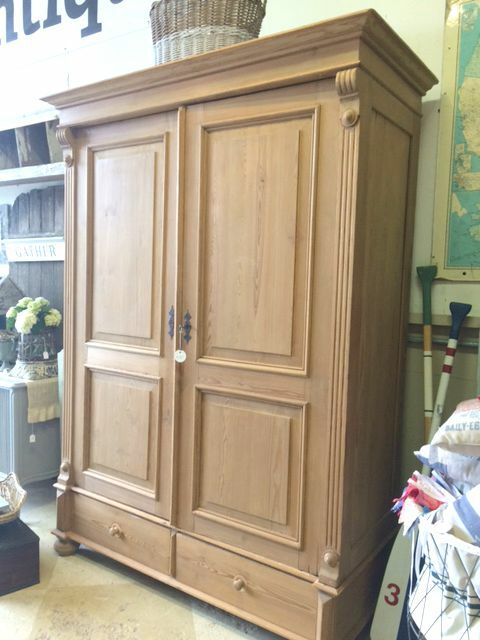 I am in love with armoire and the beautiful wood. What a sweetie your husband is. The armoire is absolutely beautiful ~ especially after you got it home and did your magic! I hope you had an incredibly wonderful anniversary celebration! You two are such a great pair. Happy belated Anniversary, Kris, to you and your husband! You were a gorgeous bride. Such a beautiful piece! This is the perfect gift! Happy anniversary!